In the early days in the Red River Settlement lands were surveyed and claims settled in the Indian way. All one needed was a neighbour, a horse, and a long red pole. To stake a claim, you set out and rode along until you reached the piece of land on which you had set your heart. Then you dismounted, and to stake a claim, you, turning him sideways, stood at the side of the horse. Stooping down, you peered between his hind and his front legs to get your bearings and, except for occasional side swipes at mosquitoes, you remained stooped while your neighbour walked away in a straight line carrying the red pole. When he was about to vanish from view you shouted "Hi" and waved your arms and he stopped. You made sure that right where he stood (approximately 2 miles off) he planted the pole. Marking it thus meant that officially you had staked all the land that, whilst stooping, it was possible to see. That is, "the land bounded by the horse's hind legs and his front legs and from his belly to the ground he stood on." 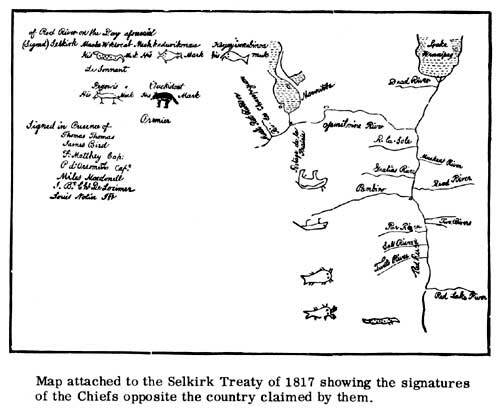 This type of survey was recognized and recorded in 1817, when on July 18 a treaty was signed by the Earl of Selkirk and five Indian Chiefs. These Chiefs, chosen to the satisfaction of both parties, solemnly made over to King George III their rights in a long strip of country, two miles back, along each side of the Red and Assiniboine Rivers. The idea of "a distance of two miles, " which forms such an important part of the bargain, was conveyed to the Indians by describing it in their familiar horse and pole way of settling claims. On this historic occasion, in exchange for the land, the Chiefs were given an annual payment of one hundred pounds weight of tobacco; it was agreed that this was to be paid to the Saulteaux Chiefs at Fort Garry and to the Cree Chiefs at Portage la Prairie, each payment to take place on October 10. The Chiefs signed by making their distinctive marks, that is, they made the outline of the wild animal by which each Chief was known. These signatures were placed opposite the tracts of the country claimed by them. On that July day when the five Chiefs signed, this early Settlement business deal was closed.